We are delighted to welcome Arthur Pinkers as speaker for our June 1st meeting. Arthur has been an orchid enthusiast for almost 40 years when, as a 16 year-old, he acquired a plant of Slc. Glittering Jewel (Sl. Gratrixiae x Slc. Hermes) and was infected by the orchid bug. He and his wife Margie of over 25 years have two adult children who recently graduated from high school and are attending College of the Canyons. Arthur grew up in the Seattle area and attended Western Washington University graduating with a B.S. in Chemistry and Biology. He and his wife currently live in Santa Clarita, California where Arthur is learning to grow orchids under extreme conditions, very different than those in his native Pacific Northwest. Arthur worked for many years as a chemist and also had the fortune of holding his dream job as the Lab Director for Beall Orchid Company until shortly before its close in 1990. Arthur’s interest in orchids covers a broad range of types with botanicals being a special draw. 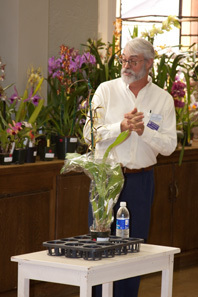 Arthur has served on most executive positions on the Board of the Northwest Orchid Society and is a Past President. He is a veteran Accredited Orchid Judge and serves as a photographer and as Chair of Information for the Pacific South Judging region. 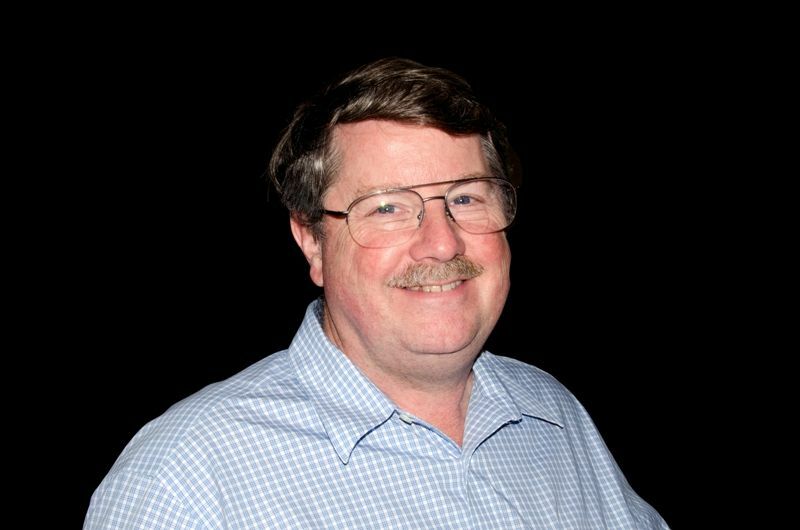 Previously he served as center photographer for the Pacific Northwest Judging region. Arthur’s talk should be very informative on a subject that we have not had in recent history. Arthur will provide the POT, which will feature plants from Santa Barbara Orchid Estate and Orchids Royale. Our guest speaker for our next SFVOS General meeting on March 2, 2016 is our very own SFVOS Vice President Pamela Aitchison, who will be sharing information about how to keep our orchids healthy in our home environments. Her talk will cover many topics that will especially be of interest to new orchid growers, but experienced orchid growers may learn a trick or two as well. Pam is a Certified University of California Master Gardener, and has been teaching organic gardening for many years. She provides training to the new Master Gardener Candidates every year, and is a regular guest lecturer at California State University Northridge (CSUN), the LA County Fair, and schools and non-profit organizations throughout Southern California. 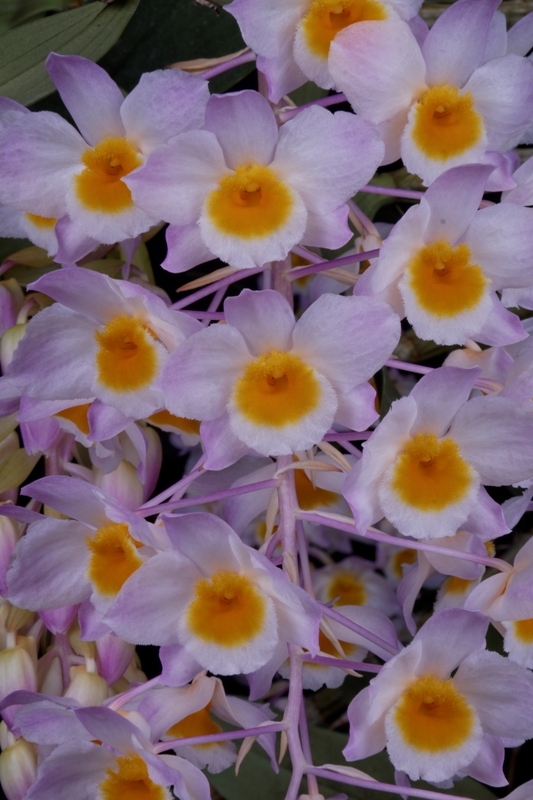 Pam has been growing orchids for more than 30 years, and her collection includes Cattleyas, Dendrobiums, Epidendrums, Miltonias & Miltoniopsis, Oncidiums, Masdevallias, as well as Phalaenopsis, Cymbidiums, Vandas, Vanilla Orchids and Zygopetalums. Pam will be showing us a PowerPoint Presentation and will hopefully give you many ideas and suggestions for caring for your orchids at home. You won’t want to miss this lecture, so mark your calendar today. 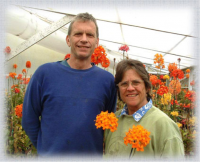 Our guest speaker for January will be James Rose, owner of Cal Orchids. Jim will open his presentation by teaching us the best way to re-pot our orchids. This is an important skill, and is a subject many have requested. His main topic will be the “Orchids of Madagascar”. Madagascar is best known for its remarkable fauna, including the famous lemurs. It is also home to over 900 orchid species in 57 genera, many of which are as endangered as the lemurs. These orchids are so beautiful and unique. You may be familiar with the story of “Darwin’s” orchid. Angraecum sesquipedale, which is also known as the Christmas orchid, Star of Bethlehem orchid, and King of the Angraecums, is an epiphytic orchid in the genus Angraecum endemic to Madagascar. It is noteworthy for its long spur and its association with the naturalist Charles Darwin, who surmised that the flower was pollinated by a then undiscovered moth with a proboscis whose length was unprecedented at the time. His prediction had gone unverified until 21 years after his death, when the moth was discovered and his conjecture vindicated. and Eulophiella roempleriana. Be sure to mark your calendar. You won’t want to miss this highly informative talk and the culture session on “repotting”. Our special program will include: Refreshments, Bingo Games, Orchid Plant Exchange *(Optional), Special POT Raffle! *Bring an orchid plant in a 4”-6” pot to exchange with the other members, and take home a beauty for yourself. This is a great way to expand your own orchid collection and your knowledge. Learn about collecting, growing, re-potting, and pest control from our monthly meetings’ guest speakers, many of whom are local, national and internationally recognized orchid experts. For just the cost of your annual dues, you can see their fabulous photographs, techniques, and presentations. You have the opportunity to listen and ask questions of these experts up close and personal. How great is that! Rub elbows with your fellow orchid enthusiasts. Many of our members have become good friends. Several of our members are expert growers in their own right. Ask questions, swap ideas and learn from each other, while you share a tasty snack from our well stocked refreshment table every month. Share your beautiful blooming orchids and see what the other members are growing at our monthly “Show and Tell”. Exhibitors have the opportunity to share information about their special plants and members can ask questions. You can also bring your camera a test your photographic skills. As a member, you will receive our Monthly SFVOS Newsletter via email (or by snail mail). Each issue is packed with the information you need to keep up with what’s happening in the orchid world. Every month you receive a preview of our upcoming meeting, plus a Calendar of upcoming events, educational articles, and much, much more. You’ll have unlimited access to our own com website that has hundreds of tips on how to care for your orchids. Discover what happening in the orchid world, look up a solution to a problem or download culture sheets. There is also a library of past issues of our Newsletter, links to instructional videos, and Monthly Orchid Care Checklists just to name a few of the features found on our website. Take home fabulous orchids every month from our Plant Opportunity Table (POT). For just the cost of a few “opportunity” tickets you could be a big winner. You are invited to attend our annual Holiday Party in December to share a meal and fun times. The San Fernando Valley Orchid Society is a non-profit organization. Your membership dues pay for our Guest Speakers every month, provide the plants for the POT each month and pay our ongoing expenses such as our rent, website fees, and required insurance costs. Our Monthly meetings are held on the 1st Wednesday of the month at the Sepulveda Garden Center, located at 16633 Magnolia Blvd, Encino, CA 91436. Meeting starts at 7:00 pm.